LAS VEGAS, NV — ZOTAC’s new lineup of workstations consists of three systems based on Intel’s quad-core Core i5-7500T processor and one of three GPUs: the NVIDIA Quadro P1000 with 4 GB of GDDR5, the NVIDIA Quadro P3000 with 6 GB of GDDR5, and the NVIDIA P5000 with 16 GB of GDDR5. These are professional-level graphics solutions, which ZOTAC has used in the MXM module form-factor. All three machines use a different chassis, depending on performance, expandability and power draw. The ZOTAC ZBOX P1000 workstation is the smallest one, whereas the ZBOX P5000 is the largest and the most powerful one. 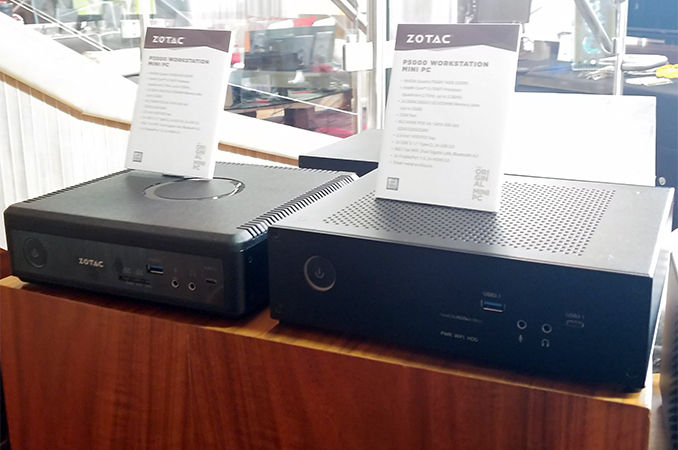 All three workstations from ZOTAC share the same concept: they are fully-integrated SFF PCs that support all modern connectivity technologies, including gigabit Ethernet, 802.11ac Wi-Fi, USB 3.0 Type-A, USB 3.0 Type-C, SD/microSD, DisplayPort 1.2, HDMI 2.0 and others. The goal is that these systems can be quickly deployed without significant customization. All the systems support up to 32 GB of DDR4-2400 memory (two SO-DIMMs), feature one M.2-2280 PCIe/SATA slot for SSDs, and one 2.5” bay for another storage device. The demonstration of ZBOX workstations with NVIDIA Quadro GPUs at CES shows that ZOTAC is interested in offering professional-grade systems. 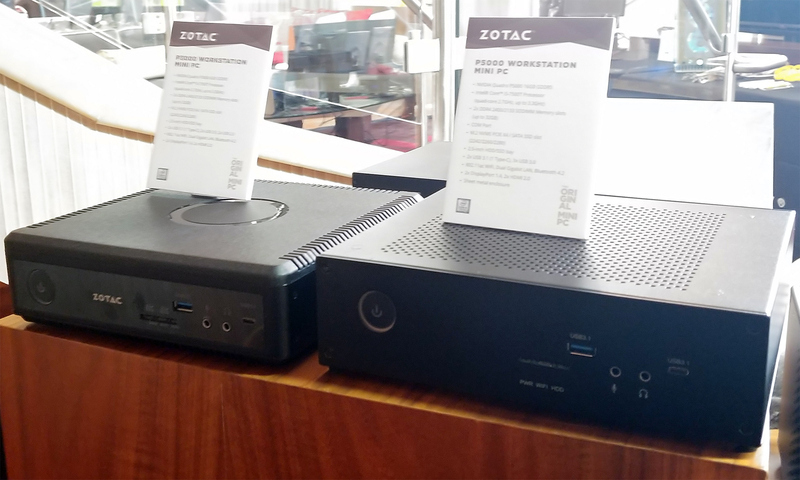 The PCs demonstrated at CES 2018 were based on Intel’s quad-core Core i5-7500T processor, which comes across as a rather unorthodox choice for a workstation, but is an understandable one given the fact that ZOTAC specializes on gaming and SFF PCs and simply has the said chips (and supporting PCH) in stock. If demand for ZOTAC-made workstations is high enough, the company might develop Xeon-based machines at some point in the future. It is noteworthy, however, that a 2018 workstation does not support Thunderbolt 3. Workstation workloads need storage space and ZOTAC’s workstations can hardly offer a lot of it (a M.2 SSD and a 2.5”/7-mm HDD will give 4 TB in total). Another interesting takeaway from ZOTAC’s workstation announcement is NVIDIA’s Quadro P1000 graphics solution in MXM form-factor. Professional MXM solutions are manufactured and sold only by NVIDIA itself, so the module is not a custom-made card by ZOTAC. The Quadro P1000 product is not listed among other professional GPUs for laptops that NVIDIA offers. ZOTAC plans to start selling its workstations in Q2 2018. Pricing will depend on multiple factors, including purchase volumes. I would have liked one of these but with AMD cpus. Anton, what size these Mini-PCs are? While having a true desktop-class PCIe graphics card with 4x mDP, it is limited to P600.